Somewhere halfway between these two songs nine of us had made our perpetual professions of vows, had said - publicly, officially, each in her own language - what we had hitherto only said in the depths of our hearts: "forever". The other three made their professions later in their own provinces. Like all RSCJ each of us made her vows, said her "forever" trusting in the fidelity of God and the love of my sisters. Since that day one of the group has left, one has had leave of absence, and the rest have had our wobbles, our times of difficulty and disenchantment, as well as our times of contentment and certainty. Like any other way of life religious life has its ups and downs, its joys and challenges - at times both sides of the same coin. But throughout, regardless of how we have been, two things have been sure: that we have been loved and supported by our sisters, and that the God who lovingly called each of us by name, beyond our fears, has been faithful. That in itself is something worth celebrating! A few days before profession each group is given a name by our Superior General: one that sets a seal on our experience and character as group, and calls us into our new identity as professed RSCJ. Effectively, we have each been doubly called by name! 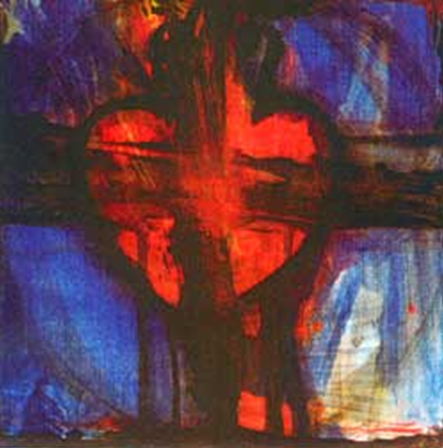 My group is The Open and Welcoming Heart of Jesus, and the picture on the right was given to us as our emblem. ¡Feliz Aniversario! Que cada día sigas estrenando aquel sí y seas expresión del Amor grande de Su Corazón. Happy Anniversary Silvana. Thanks for all the good memories, love and support. May this year be another year of discovery into the open and welcoming heart of Jesus. Love and prayer. Thank you everyone for your loving greetings and support. "In the strength of his Spirit, together we will glorify his Heart"
Gracias por vuestros saludos carinosos y apoyo. "En la fuerza del Espiritu, glorificaremos juntas su Corazon".